Best Price Guarantee | Vegas.com: If you purchase your tour/s via the link provided on this page and find a better price for the River Rafting Down Black Canyon Tour, Vegas.com will match the competitor's price and refund the difference. That’s customer care you can count on. 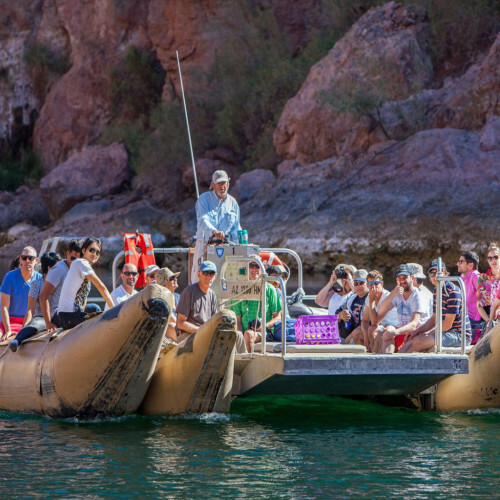 Enjoy smooth waters and blue skies as you explore the Colorado River on this guided raft tour. Plenty of sunshine and spectacular scenery make this a wonderful sightseeing tour. Watch for bighorn sheep grazing along the walls of Black Canyon as you float along the rapid-free portion of the river. Your tour will include a picnic box lunch with a choice of a sandwich, chips, fruit and a beverage to enjoy on a shoreline beach of the Colorado River. Black Canyon Raft Portion: This is not a whitewater rafting trip. The raft portion of this tour includes a slow water trip on a pontoon style raft. These are large comfortable rafts which have been carefully constructed with your safety in mind. They have multiple air chambers and are outfitted with all of the Coast Guard required and recommended safety equipment. All the rafts have plenty of room for passengers, so you will not be overcrowded. During this excursion, the experienced and knowledgeable guides share the history of this magnificent geological area.